Have you ever gone through your music collection and stopped to think "When or how did I first discover this band?" I do it pretty frequently and usually can't remember. The Pipettes are no exception. The Pipettes were a British female-fronted pop group that started out in 2003. While the girls are always front and center with their polka dot dresses, the are backed by an all male band called The Cassettes. Their sound takes the best of bubblegum pop and combines it with the doo wop of the 50s/60s. The result is some insanely catchy, upbeat music. Now normally, my taste tends toward rock, metal, and punk but I do love the music of the 50s/60s and consider bubblegum pop a guilty pleasure so this is like a peanut butter cup of musical styles for me. Their debut album, We Are The Pipettes, hit 41 on the UK charts and gave them their biggest hit "Pull Shapes" which topped out at 26. As part of their US record deal, the album was completely remixed, given two additional songs and a new cover inspired by Attack of the 50 Foot Woman (above). In the US, the album hit 18 on the Top Heat Seekers chart, which I had no idea was even a thing. Your Kisses Are Wasted On Me. Along with various singles and a pair of EPs, they also released another album in 2010, Earth vs The Pipettes. The sophomore effort fizzled and sadly the girls disbanded shortly after its release. But that's no reason to not check them out so go ahead and spin a couple tunes and see what you think. You can find both their albums on Amazon. What's that sound? 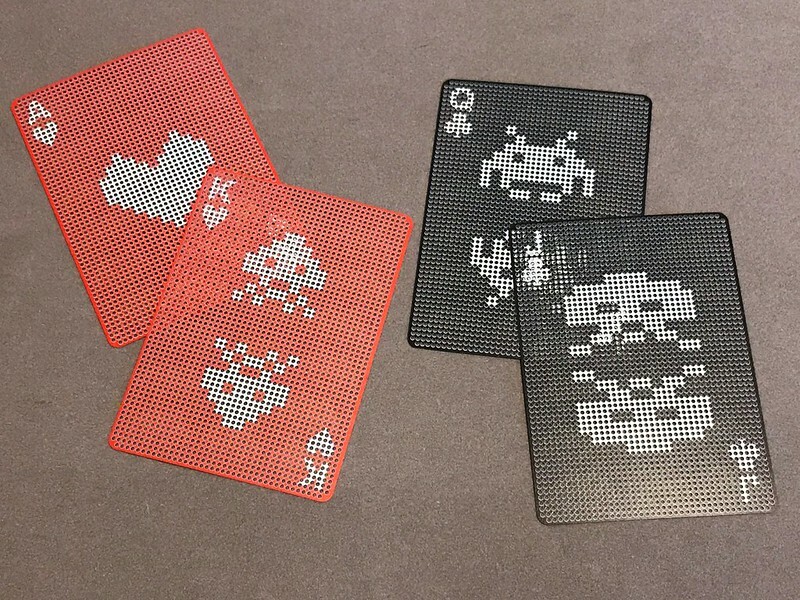 (It's not Jaws) Jump in your tank and get ready to defend the Earth because the Space Invaders are coming to play...cards. This deck of cards was released in 2013 by a company called Kikkerland. 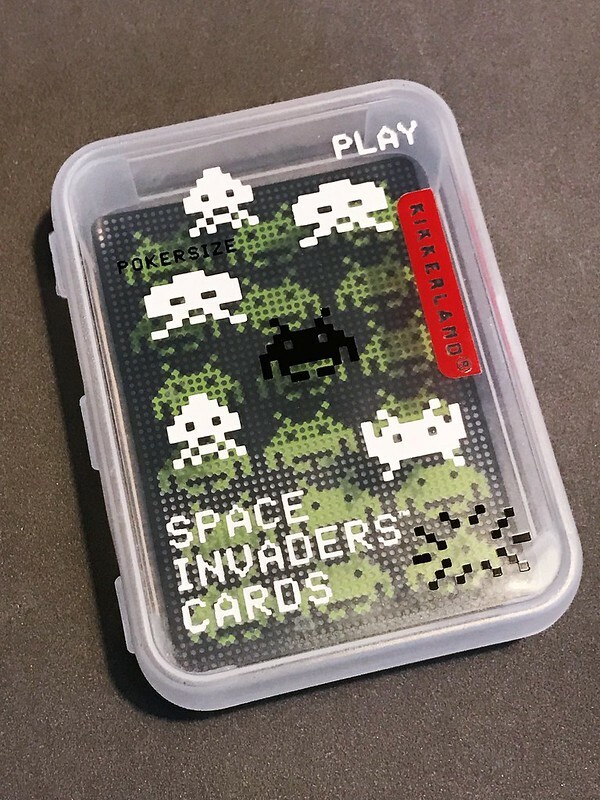 They come in a plastic snap case that is mostly clear with Invader game graphics which look nice on the case but make it difficult to take a good photo with the cards in it. The cars all feature pixel art. 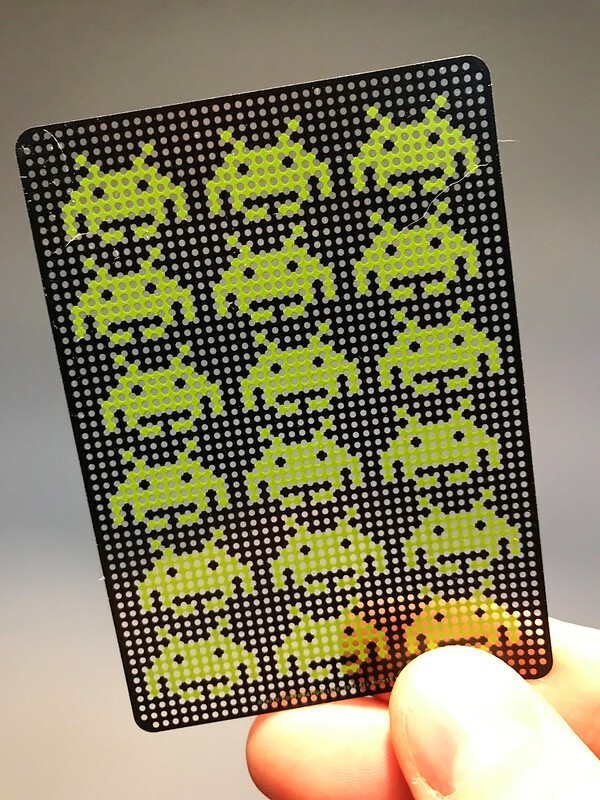 I really like the card back design with the green Invaders. Both Jokers have the same design. If I put this together, the Jokers would have been the flying saucer and the tank, both of which are absent from the deck. You might have noticed the cards look a little odd. That's because they're plastic and have lots of tiny holes. 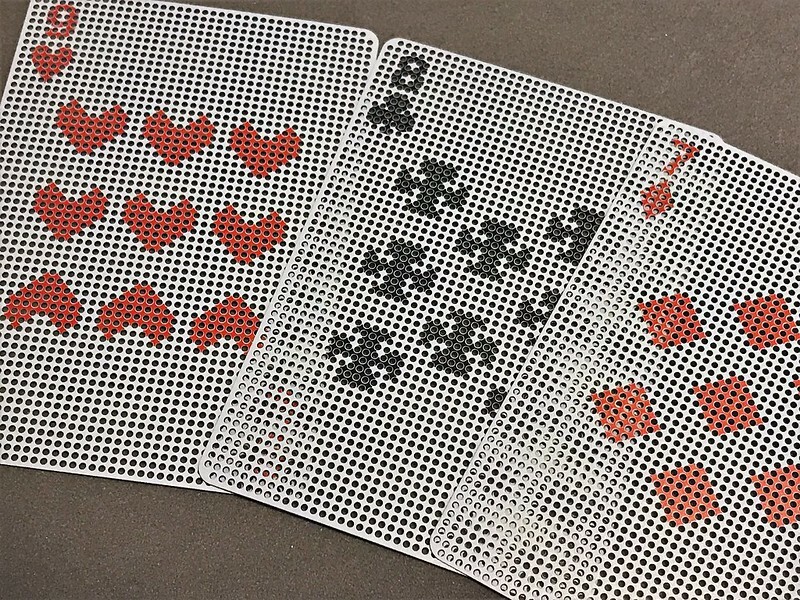 Being plastic, they're waterproof but if you've ever tried to play with wet "waterproof" cards before, you know they end up sticking together. The face cards have the same graphics in every suit. Being Space Invaders, there's not a lot of characters to choose from so I can't fault them for being identical. The colors are inverted from the numeric cards, with the suit color being the background and the characters being white. Maybe they wanted to stick to the game colors for the Invaders and not make them black and red? Here's a close up of the cards. 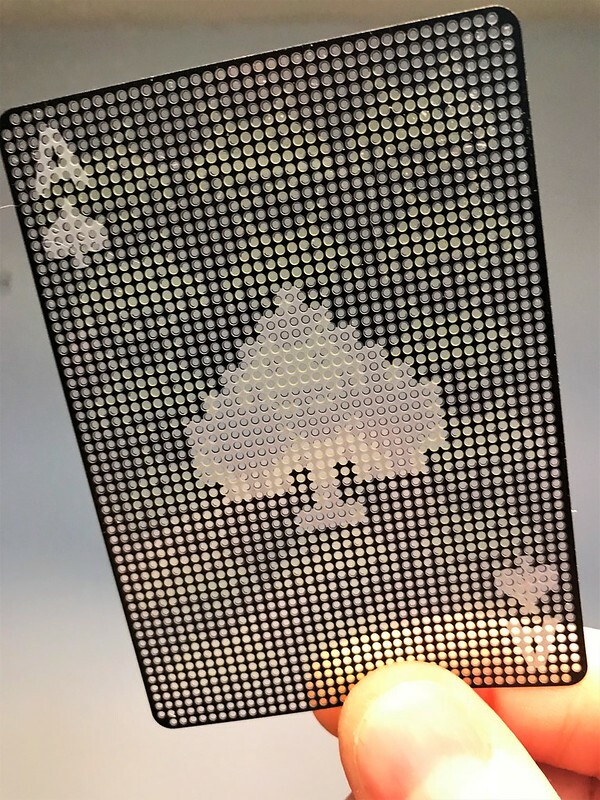 All the tiny holes make the cards somewhat see through. But don't worry about anyone cheating when you play with these. If you look through the face, you can see the back design. But if you look through the back, you can't see the face. I'm sure there's a simple way they did this but I think it's pretty cool. The next time you're hanging out on a moon base and need to pass some time on your shift protecting the Earth, you should probably be watching the radar. 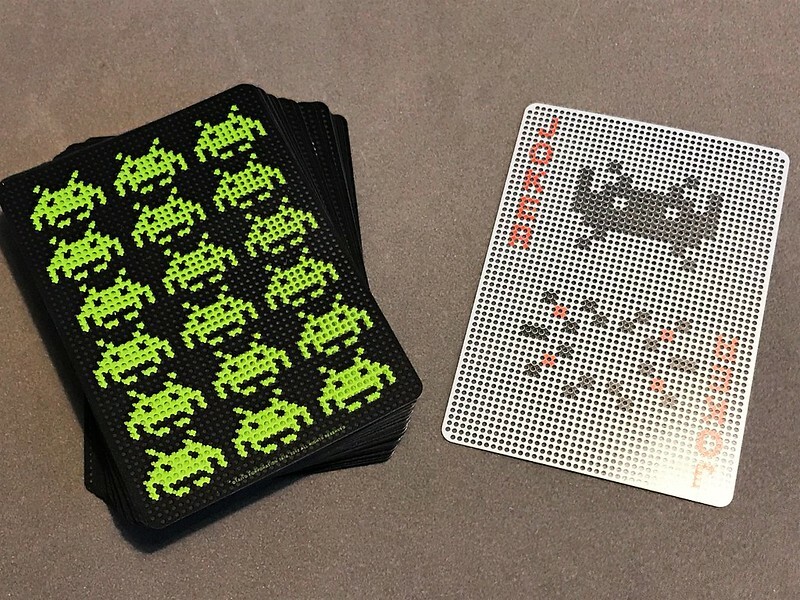 But if you're really bored you can break out these Space Invader cards for some solitaire that won't destroy life as we know it if you lose. 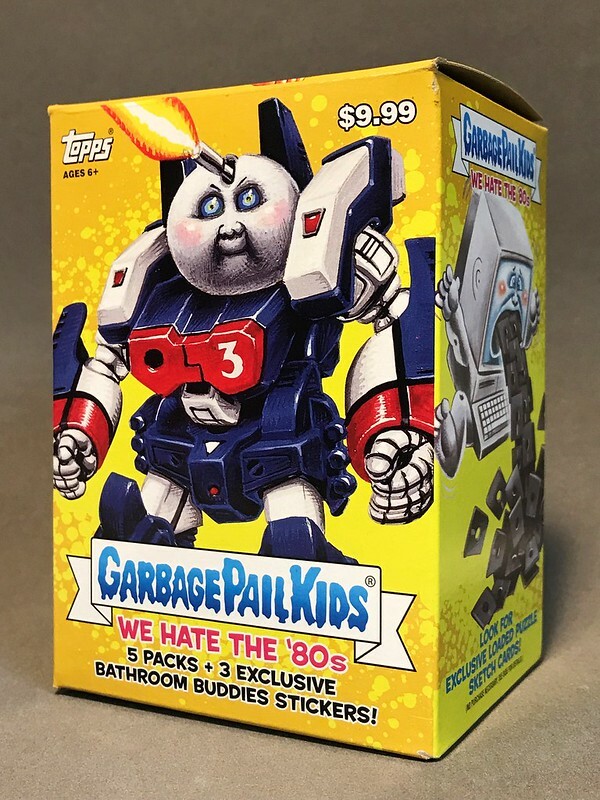 The Garbage Pail Kids Hate the 80s! 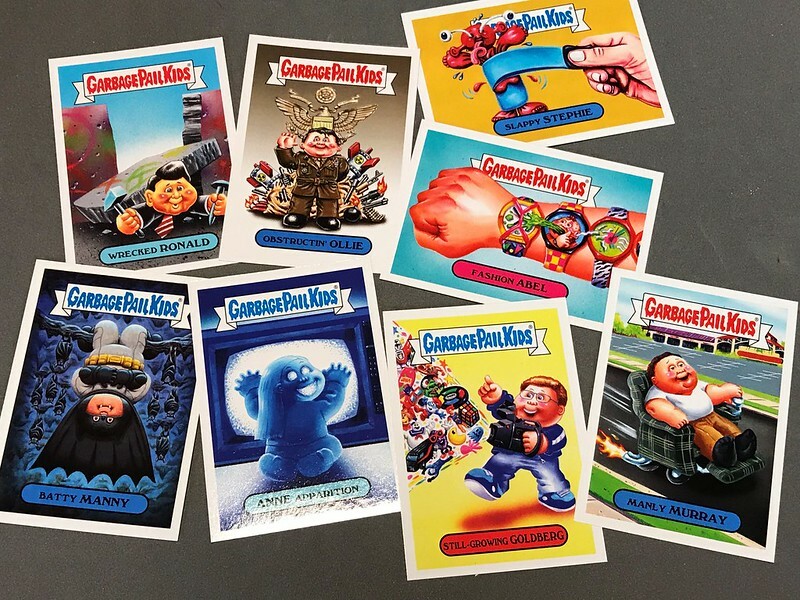 The Garbage Pail Kids from Topps are back again and this time they're taking on the decade that made them, the 80s! 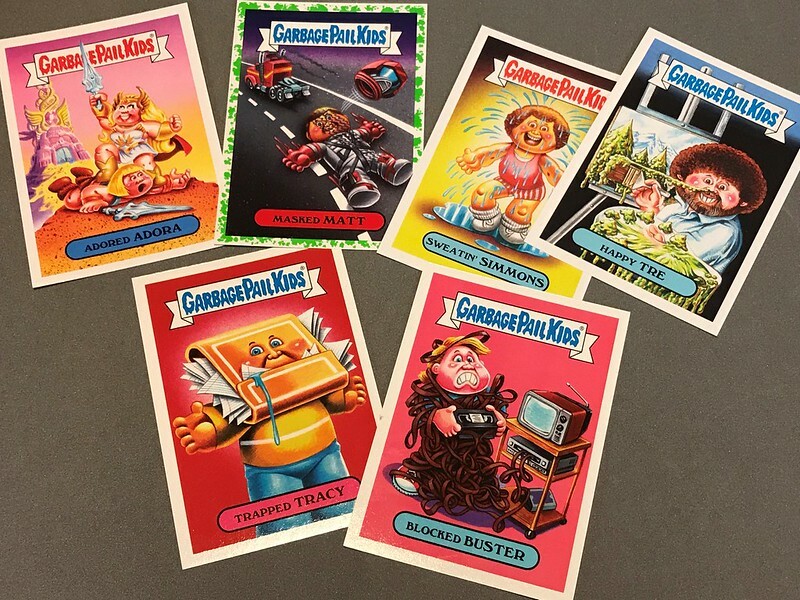 I loved Wacky Packages as a kid and got into the first round of GPK as is evidenced by the inside of my high school notebook. The base series is 180 cards made up of 90 different characters, each with two different names. There are 10 subsets tackling all aspects of the 80s. If you want to spoil yourself, you can grab the checklist from Topps. Granted it's only card names with no pictures but you can probably figure most of them out. Here we have cartoons, celebrities, and culture. The Masked Matt card has a mucus green border because it's a parallel or variant. You get one in each pack. There are also fool's gold variants that are 1:48 packs. These are individually numbered as there are only 50 gold variants for each card. Then we have history, fashions & fads, movies, and sitcom. The sitcom cards all feature characters from The Goldbergs TV show. There are randomly inserted autograph cards (1:1926 packs!) signed by the one of the show's cast. Rounding out the base set are toys, TV shows & ads, and video games. The cards are available at retail big box stores like Target and come in single packs ($2) or a box of 5 packs ($10) which has 3 Bathroom Buddies stickers in each box. You can also go the hobby box route which will run you between $45-$50. Hobby boxes are always more expensive but that's because they have even more stuff in them than the retail packs. 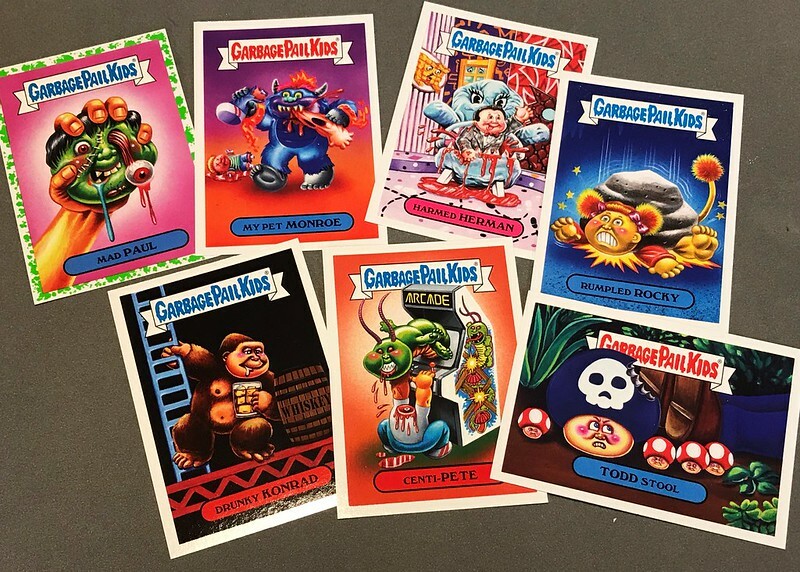 The hobby boxes have additional inserts that include reprints of classic 80s stickers, the Gross Bears (Care Bears), sketch cards, autographs, and wax pack parodies. 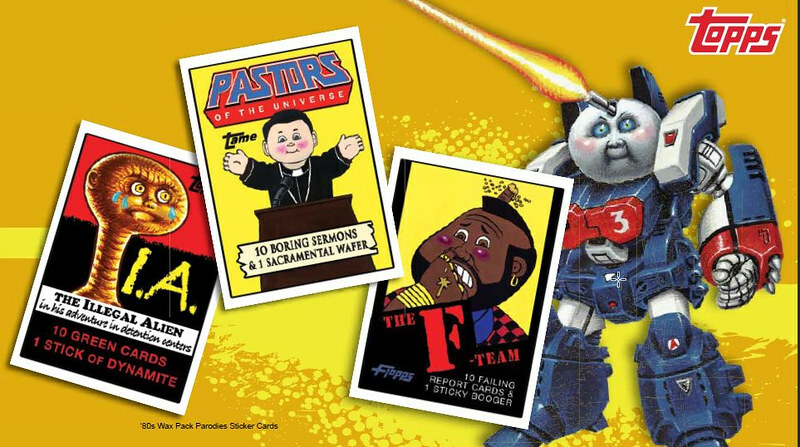 I'm a little tempted to grab a hobby box just to try and get some of these wax pack cards! If you're an 80s kid or just love 80s culture, I cannot recommend this set highly enough. Much like watching VH1's I Love the 80s, it'll have you strolling down memory lane and maybe remind you of a few things you totally forgot about.